It’s no secret that getting presentation right when selling your home can make a significant difference to the outcome of the sale. Spring is traditionally the busiest season in real estate and competition can be heavy for vendors. Here’s how to give your property the edge, make it stand out to buyers and be more memorable in the busy season. First, make sure the property is clean and clutter free. This includes removing any excess furniture and decorative items like photo frames and trinkets. These items will distract buyers from focusing on the property. It is imperative that the property is immaculately clean. Employing a professional cleaner could be helpful in providing a fresh eye in the property. Next, carry out any repairs or touch up painting. Even minor damage can put buyers off and side track them at an open home. To stand out it is important to set the scene and present the lifestyle your property offers its buyers. This includes incorporating style that both compliments the home and appeals to your buyer demographic. Styling your property with the right furnishings will help to create an emotional connection with potential buyers. Introduce style and detail through cushions, throws, accessories and artwork. These items all contribute to the overall feeling buyers get in the property and ensure your listing more memorable than others. Buying property can be overwhelming, as many buyers spend every Saturday going from open house to open house. It’s important to help buyers visualise how your space will function for them or their perspective tenant (if it is an investment property). 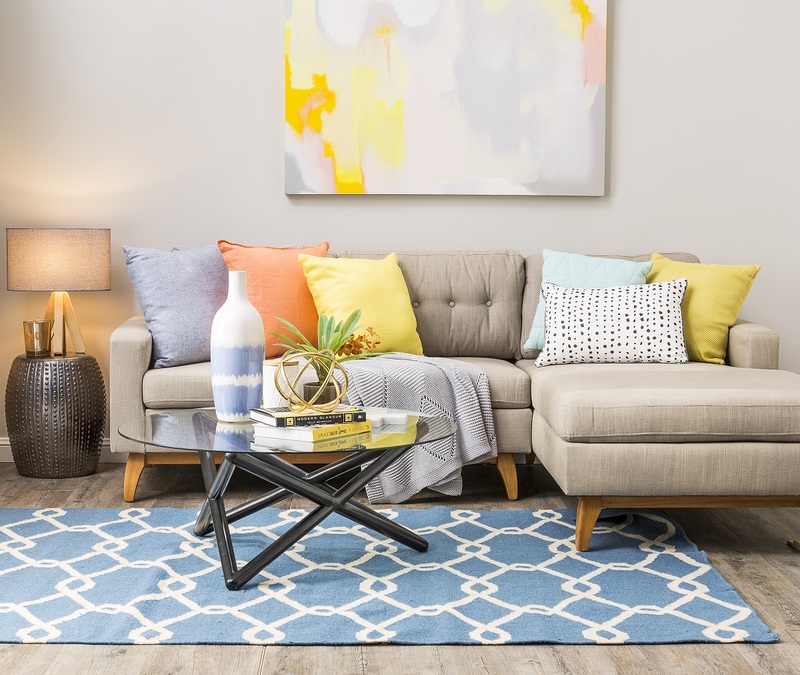 The most common error that people make when styling their homes for sale is selecting furniture that does not fit the room properly. An oversized sofa can make a living room feel much smaller and create a negative perception of the space in the buyer’s mind. Similarly, furniture that is too small can make a room look and feel odd too. For example, many people believe that placing a single bed in a bedroom it will make the room look bigger. This is often not the case as buyers immediately perceive a room with a single bed as a single room or children’s room. Convert unused and awkward areas into usable spaces that add extra value to buyers. For example, study spaces are becoming a must have for buyers and can be incorporated into most homes. Look for dead spaces such as wide hallways and unused areas in bedrooms, which could have a built-in or freestanding desk. Rethink existing dual-purpose zones to add maximum value. A sun room could become an office and a sitting area. A guest bedroom could have a smaller bed or fold out sofa bed, and a desk and chair instead of one large bed. If your home has a small living area, a fourth bedroom could be converted to a formal and secondary living area. First impressions count so a fresh coat of paint on your façade can be money well spent. Ensure you repair any outside damage such as broken fencing, guttering or outdoor lights. A definitive path to the front door is key to the flow of the home – if you don’t have a pathway, create one with stepping stones or hedges and wood chips. Make your garden a high priority in Spring. Add a few low maintenance feature plants such as Yuccas or introduce pops of colour through bright hanging baskets, fill any empty garden beds with mulch or wood chips and replace any dried up grass with fresh lawn. To give your home the best chance to present well to buyers, be organised and prepare in advance for open houses. Ensure the property is spotless on open days with no trace of pets in sight or scent. Leave plenty of time to tidy the place and vacate the property before your agent and buyers arrive. Add the finishing details like fresh flowers and burn a subtle scented candle to create ambiance and make buyers feel welcome. Open windows, doors, blinds and curtains to allow fresh air in and switch on all the lights to allow maximum light into the property. Styling your property for sale creates an ‘aspirational’ living scenario ensuring potential buyers connect emotionally with your property and realise its true functionality and potential. By dressing the property in a warm, welcoming and functional way you can tailor the appeal to your buyer demographic. Homes can be either partially or completely styled and stylists can work with some of your existing furniture to add impact, even whilst you are living in the property.